Can and should social media be used in the legal sector? Using social media is definitely not the right fit for every type of business but, used in the right way, can be a great way to gain new customers and enhance your existing customer relations. It’s the most obvious but still true, especially when you use paid social to get your brand out in front of potential clients. Appearing on someone’s timeline or feed could reach someone who hasn’t previously heard of your firm, or someone who was planning on making a claim elsewhere. The great thing about social media advertising is that it’s flexible for every budget. You can spend as little or as much as you want to, and also test what messaging or imagery gets you the best results. Social media is an effective way to build brand awareness because of the number of people that use it on a daily basis. According to the Office for National Statistics, about 65% of people in the UK were using social media in 2018. This means there is a lot of potential for reaching new customers that would be interested in making a legal enquiry. More specifically, 67% of people aged 45-54 used social media in 2018, and that was the age range that made the highest amount of enquiries with our legal brands that year. This means that social media marketing isn’t only useful for targeting millennials, but for people of all ages that may be making legal enquiries online. Having a social media presence makes your firm more accessible to potential clients. Social platforms give a place for people to reach out and ask questions without the formality of an email or phone call. Being able to answer any questions or concerns could help convert more enquiries into clients. This would also be a good place to maintain relationships with any former clients, and an easy way for them to get back in touch. Having a well-rounded web presence makes any business seem more viable and can build brand credibility. Being easy to find online will make any business seem more legitimate. Having social media accounts can also help your SEO. 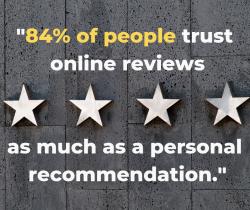 It’s an easy place for a pleased client to leave a review, and positive reviews can lead to more customers. Even if you receive a negative review, it gives you a chance to address any concerns. If you do decide to start using or investing more in social media, make sure you invest the time to make your pages look clean, keeping the information up-to-date and posting relevant content. That way you’ll be getting the most return on time invested.